It´s bonded to Polyethylene (PE) or Polypropylene (PP) with patented copolymers. PE and PP is frequently recycled often the EcoRub material consists of 95 % recycled polymers. Since 1995, EcoRub has focused in this area (also under the name Rerub AB). EcoRub has three subsidiaries – Arbergo AB which develops, manufactures and sells the work place mats, EcoElast AB witch develops and sells products from EcoRub®and agriculture products through ProFarma AB. In 2009, EcoRub started a cluster project in northern Sweden focused to generate value to the ecological rubber market. This cluster includes both development companies and companies with market connections. In 2010, a 3 year EU funded project – EcoInnovation -was initiated EU financed half the project cost and the other half was funded by EcoRub and the three partner companies. The EU had realised that a number of environmental innovations had difficulties in entering the market. The EcoRub project was called ACE (Advanced pre-commercialization of Eco rubber materials). The goal for the ACE-project was to establish Europe´s first value chain of recycled rubber from end-of-life tyres to high quality rubber & plastic end products. This projects first half aimed to identify possible applications and markets for the innovation. EcoRub claimes to have succeeded very well with that and that the company was forced to exclude a long list of prospects, due to lack of resources. The company also claimes that only a handful of projects was selected. The properties for the material is stated “to be very good and exceeds properties for similar virgin material as EPDM, Santoprene, etc . The material is also stated to have supreme ageing properties, it is easy to glue, has very good flex values and is easy to reuse. The hybrid material is a thermoplastic material and has substantial lower production cost compared to vulcanized materials”. The invention has proof of concept since it has been used in the US for soon 20 years (between 15.000 and 20.000 ton are annually produced in the US) there. 50% of the rubber is delivered to the automotive business. 1. Tyres Herco SA in Greece is a rubber powder supplier and will develop various standard grades of raw material. 2. Business Interest Association, ACS is a carsubcontractor cluster in Slovenia to find applications for our materials in cars. 3. Karlsruher institut fur Technologie is a research institution working with construction materials and to seek and develop applications for this. 4. EcoRub AB is the project leader and have the primary responsibility for the customization of the material and to seek European markets for ecological rubber. “The company Ecorub will set up their production in the factory previously owned by Armstrong in Holmsund, outside of Umeå. The facilities have been vacant since 2011 when Armstrong closed down and 100 people were let go. But recently there has been new activity on the premises, it’s the company Ecorub that has moved in and they will start their production shortly. Ecorub produces a special rubber made by recycled tires and plastics. -The material is called Thermoplastic rubber (TPR) and has specific features that separate it from both plastics and rubber. It’s a special method that makes it possible to merge large segments of rubber, says Kurt Westermark, CEO at Ecorub. The company has tested the production of rubber mats to store hazardous waste in landfill. Arbergo AB and AB Prof Armawill, i. e. two of the Holmsund subsidiaries will be reallocated to purpose-built premises in Åsele. The reallocation shoould result in lower rental costs and other cost savings. The move frees up space in the facility in Holmsund space that will be needed for the planned production of rubber sheet and injection molding feedstock. The reallocation to Åsele is expected to be completed by mid-year. EcoRubs acquisition of a disused factory floor in Holmsund has attracted the attention of a large international flooring company who wants to discuss a collaboration on the production of vinyl flooring and Wallcoverings and walls. Such cooperation would require that EcoRub also has access to additional production in the factory. Today, the contract gives EcoRub an option to test drive the production equipment and evaluate the conditions for manufacturing of flooring products. EcoRub has, as previously announced, has acquired the so-called rolling line in the factory floor in Holmsund. Although sales of EcoRubs organic rubber is expected to increase dramatically in the coming years, there will be excess capacity in this production for the foreseeable future. Opportunities to resume manufacture of flooring products have been discussed previously and has now been updated by the interest shown by a large international flooring company. In order to produce vinyl flooring and Wetroom, EcoRub must get access to the so-called laminating line. It would, except for the manufacture of floors, also enable the production of certain products based on EcoRubs organic rubber which can not be manufactured in only rolling line. EcoRub claimes that the market for this type of flooring is very large and that the production was stopped three years ago. Furthermore, the company states that this has created a vacuum in the market and there has been a near-monopoly for certain flooring products. Another interesting possibility arises – in addition to the manufacturing floor – to quickly provide high capacity utilization in the plant. Experiments in the laboratory have shown that it is possible to replace environmentally harmful PVC with price and quality competitive organic rubber bearing in the bottom layer of vinyl flooring. Thus, this can open a significant market for EcoRubs organic rubber. The option agreement expires on 1 May 2015. During this time EcoRub has the opportunity to conduct production trials to the extent it deems appropriate, evaluate production costs and negotiate with one or more flooring company for cooperation. The option is complimentary and includes apart from the production line even necessary facilities for manufacturing and warehousing. Marketing and sales of flooring products has already begun. Ecorub has recruited a highly experienced person who has held leadership positions in a global flooring company and who has good contacts in most major flooring companies in Europe and other parts of the world. The goal initially is to contract with a major company and begin production of flooring products in 2015. EcoRubs has through its subsidiary ProfFarma AB sold and delivered the first mat of organic rubber to a open space animal barn in a facility in northern Sweden. The floor of this type are often very slippery, causing injury to animals. The carpet´s main role is in this case is to minimize the slipperiness. During the winter time-consuming manure removal with tractors might be avoided if the non-slip surface retains its properties. Experience to date is unambiguously positive. ProFarmaAB has previously sold and installed carpets to stall aisles and boxes in cow houses as well as horse stables. There is a large potential market in Sweden and especially internationally for these products. To reach the global market, EcoRub has established contact with a major and global distributor of equipment to the stables and sales. The EcoRub goal is to achieve sales agreement with one or more international companies in this industry. Rubber mats has previously been used as flooring in living quarters and there is thus an established market for such a product. EcoRubs environmentally sound stall mats of organic rubber and with an attractive price level are judged by the company to be very competitive in this market. Now, EcoRub now has reference facilities in various types of stables. The rights issue in EcoRub, traded on AktieTorget, adds clean tech company about 9.3 million before issue costs. It is clear from a press release. The issue was oversubscribed with a subscription rate of about 150 per cent. If all of the attached warrants are exercised to the highest strike price, EcoRub will recieve an additional approximately 6.1 million before issue costs. “By the capital we supplied EcoRub will continue to move forward as planned, with a focus on production, marketing and sales activities. We now have the potential to expand the business and significantly increase the company’s sales,” says CEO Ulf Bergström in a written statement. Since 2006, an EU Directive (2000/53 / CE) exisis, which says that 85% of the cars weight is to be recycled. Approximately 75% of a car’s weight is made of metals. From year 2015, 95% of the car will be recovered. The United States produced, in 2006, approximately 7500 tonnes of recycled rubber which about half goes to the American car industry in accordance with the patent EcoRub AB will be for Europe. Approximately 100 people are working to produce raw materials in the form of rubber sheets and granules. A total of 300 people work to make products to the American Automobile Manufacturers of recycled rubber. The market valueat that time in the U.S. is about 300 million SEK but is growing very strongly, with the material now accepted on a wider level, after having been tested at production scale for about 5-7 years. The Swedish car companies is owned by American car companies and with the materials is also approved for use in the Swedish cars. What is missing is the approval of application level. The benefit for the customer is that applications are about 30% cheaper to manufacture than current products. They have lower weight, equal or higher quality and are capable of the car industry recycling requirements, which the current does not. The EcoRub business idea is to introduce the possibility of mainly Volvo and Saab, and then with their consent to ensure that the subcontractors are using by the recycled rubber in applications. The raw material, in the form of raw rubber and injection molding, can be initially imported from the USA and in the next step to be manufactured in Europe. Support will be available from Luleå University of Technology (Dept of Polymer Engineering at the Department of Applied Physics, Mechanical and Materials Engineering) for verification and development of material specifications. Support is also available from the United States from thay that previously introduced the material to the American car industry. The total market in Europe for products made of recycled rubber for the car industry as technical, quality and price is competitive with existing products has been estimated at 200 000 tonnes per year – about 5 000 000 000 SEK. An intermediate target is to take about 5% of this market, which represents an annual production of a rubber factory that go for ”full steam”. The knowledge that is represented in the European patent is a world leader. EcoRub states that there are no serious competing solutions. The technology represents a good environmental choice in the sense that the rubber is recycled and the patented material in turn can easily be recycled. The manufacturing process is environmentally unproblematic. EcoRub also state tat “we work in an environment where competition is missing on our territory and the introduction and development work are already done and available to us”. 250 million used tires generated in the EU per year. In the world scale, it is four times as much. 1 billion tires are stored only in Europe. The mountain of used tires is unimaginably large. There are large amounts of resources and waiting to be exploited. They represent very large amounts of oil that can be reused. In the global scale, this represents in terms of oil, 2 supertankers perdays of the Exxon Valdes size (who ran aground in Alaska in 1989). THE U.S. PRODUCED, IN 2006, APPROXIMATELY 7500 TONNES OF ECOLOGICAL RUBBER IN THREE COMPANIES TO AMERICAN CARS IN ACCORDANCE WITH THE PATENT ECORUB AB OWNS EUROPE. The Swedish car companies is owned by American car companies and the materials is also approved for use in the Swedish cars. What is missing is the approval of application level. The benefit for the customer is that the applications are usually less expensive than current products. They are (usually) lower weight. They are equal or higher quality. They do automotive recycling requirements, which the current does not. The total market in Europe for products made of recycled rubber for the car industry which in technology, quality and price is competitive with existing products, has been estimated at 200 000 tonnes per year – approximately 5,000,000,000 SEK. This represents about the amount of tires that are discarded in Scandinavia. 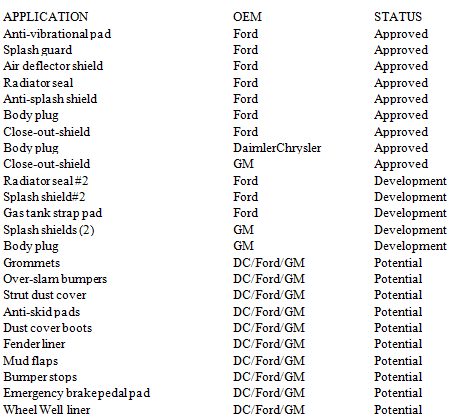 Below you will find the products found in the cars today. THE TABLE ABOVE IS FROM THE YEAR 2005, TODAY ALL OF THESE PRODUCTS ARE APPROVED. Measured in tonnes, the largest item is mudguards for trucks and passenger cars. Here is the spare parts market dominant. Then the mats lying on the beds of pickups and similar, then the seal around the wheel arches, air intake and radiator package will take place. Now the sealing strip round doors and windows are under development, and the same applies to one material that can be used in the ”bumper” and other bodyparts. A ton of rubber tires gives, rough estimated, three tonnes of carbon dioxide when incinerated. When using rubber tires for heating purposes, about 20% of the energy spent in producing the tire. A Swed is estimated to produce an average of six tonnes of carbon per year. In Europe (and Sweden) the reuse of tire rubber into new products are so low that statistics are not implemented. In Sweden, most of the decommissioned car tires are incinerated and allowing 80% of the energy released to the production of car tires go to waste. This despite the fact that there is a producer responsibility of car tires in Europe, aimed at the material to be reused. EcoRub AB has a unique patented technology to recycle rubber tires into new products. Today, manufactured around 7500 tonnes to American automobiles according to this technology. EcoRub AB plans to start recycling of tire rubber in Piteå and manufacture new rubber products to automobileindusty among others. EcoRubs technology provides properties that are similar to ordinary rubberqualities and that in turn can easily be reused. Almost all oils contains Polycyclic Aromatic Hydrocarbon (PAH). But if it contains less than 3%, according to EU regulations, it´s not to be declared. PAH´s are harmful substances which affect, microorganisms among other and provides lung damage in humans and risk of cancer. What is known is that those who manufacture rubber products have an increased risk of lung problems and cancer. Any impact on the environment around the roads are not yet known except for the effect on algae and microorganisms, mainly in aquatic environments. Main emission sources are car exhaust gases and particles from asphalt roads. Then the dust from the tires. Abrasion from asphalt roads is expected to generate 110 tons per year in Sweden, vehicle exhausts 38 tons and tires provide about 10 tons. Particulates from tires and road surfaces are mainly located close by the roads. However, traffic fumes migrate long distances and it is PAH´s from car exhaust fumes which in practice may be the risk of ”ordinary people”. There are a lot of unserious lobbying and false information on this where players ride on the fact that the levels below 3% do not have to be declared and the appearance of their oils and rubber products do not contain anything at all. Used Rubber (aged tires) lose a lot PAH´s in their use – 25%. It results in the second-hand rubber may well contain as much (little), PAH´s as new rubber shown as PAH-free under EU rules. Furthermore, we will be aware that the PAH-oil in the rubber, very slowly leaks out. A pile of cut up tires at 2000 tonne leach out as much PAH to environmental in a period of 30-100 years, as emissions from driving with a 4-strokecar consuming 1 kg of petrol. A new two-stroke engine emissions of PAH´s from 1 kg gasoline equivalent leaching from 16 000 tonnes of rubber clip for a long time (30-100 years). EcoRub rubber products contain about half plastic polymers. This allows the content PAH´s to sink to half. Furthermore the plastics locks into oil in exactly the same way as plastic bottles of oil (which you buy at gas station) will hold oils. EcoRub rubber products are therefore very low risk in comparison with new rubber, although the new rubber contains oils that have lower PAH levels than 3%. Only to start the car in the morning emit significantly more PAHs in the environment than potential leaching from the products of recycled rubber as an entire factory can create. The mountain of used tires is unimaginably large. And do not even know what to do with it. Only in Europe 3.3 million tonnes used tires are created per year. In the world scale, it is four times as much. 1 billion tires are stored in the EU. The world-scale corresponds to the used tire, measured in oil, two supertankers per day of the Exxon Valdes size (who ran aground in Alaska in 1989). The EU has a ”ladder” for the valuation of how tires are reused . Bottom is a landfill (which is forbidden – but still takes place), the next is used for energy purposes, then ”material compensation” – where smashed car tire rubber replaces other materials for examle gravel for construction of roads, sports facilities etc. The top step is re-farming of rubber as a material for products with similar properties. Recycling tires into new rubber products is so low that statistics are not implemented but should not exceed 1%. In Sweden, however, most of the used tires are incinerated. Then 20% of the amount of energy required to manufacture the tire are recovered. When the tire is recycled it´s recovered the closed volume 55 times better. Within the EU, recycling of tires is a prioriticed issue and tightening of the laws is continuous to get that state. From 2003 it was forbidden to deposit the entire tire and from 2006 was forbidden to deposit the cut tire. Tightening is announced in terms of reducing the burning of tires. These are hard facts on rubber recycling. Technology exists, developed by EcoRub AB, where rubber tires can be turned into rubber sheets, injection molded and extruded products. More than 7500 tons per year of those products are manufactured in the United States in accordance with EcoRub’s technique of which 7 are products of Ford’s, Chrysler’s and GM’s cars. TO DEAL WITH THE RECYCLING OF USED RUBBER IS AN IMPORTANT PART OF LIMITING THE GREENHOUSE EFFECT. RECYCLED RUBBER FROM TIRES REDUCES THE CARBON IMPACT BY 45 TIMES COMPARED WITH THE NEW RUBBER. Important note: The reader might argue that EcoRub does not fulfill these criterias today, due to the current import from the US. However, soon EcoRub plans to establish the full value chain within Sweden. gaskets for high pressure. 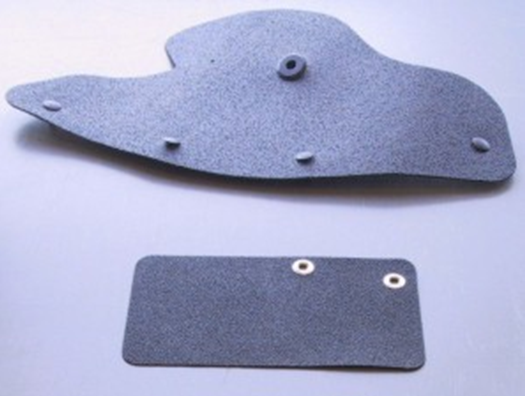 Hardness of 65 Shore A hardness of rubber is normal for rubber flooring, etc. The rubber with 75 Shore A can support the weight better if that’s needed. The thickness of the sheets can be a maximum of 12 mm and the width, in most cases, up to 250 cm. All sheets can be pre glued with pressure sensitive adhesive. The hardness can be varied according to requirements, but the stock is in 65 Shore A.
WASHINGTON (Nov.10, 2014) — In recognition of National Recycling Week, Nov. 10-16, the Rubber Manufacturers Association (RMA) has issued a report showing that more than 90 percent of scrap tire piles in the U.S. have been cleaned up while 96 percent of the more than 230 million tires discarded in 2013 were reused in several markets. Three scrap tire markets consumed 86 percent of annually generated tires in 2013 — tire-derived fuel (TDF) used 56 percent, ground rubber 25 percent, and civil engineering 5 percent. TDF is used by the pulp and paper industry and the cement industry as a supplemental fuel due to the high BTU content, the RMA said. Ground rubber is used to create a variety of products including athletic fields, playground cover and binding agents used to create asphalt road surface. Finely-ground scrap tire rubber also is used by some manufacturers in new tire construction. Civil engineering applications use shredded tires as a substitute for other “fill” materials such as sand or gravel. Common uses include road and landfill construction and septic tank leachate fields. “Ongoing scrap tire management efforts in the U.S. have been tremendously successful,” said Dan Zielinski, RMA senior vice president, public affairs. At 2015, the EcoRub goal is to have a market value of 25 M€ (http://www.ecorub.eu/). CESI speculates that this goal might be met within 16 months (if the global stock market remains relatively stable). EcoRub and Ragn-Sells starts a partnership that gives EcoRub access to high quality rubber powder / granules. Ragn Sells, in return, gets access to landfill mats. 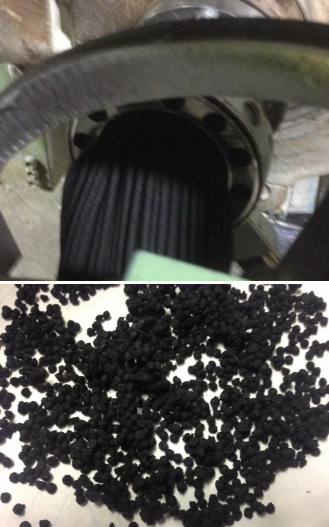 The main raw material in EcoRubs planned production is rubber powder / granules based on used tires. Ragn-Sells may, in its modern facility in Vanersborg manufacture materials in the qualities EcoRub requires for its production and is also free of banned chemicals, metal and textiles. Through the Ragn-Sells collaboration, EcoRub secures that the specific material requirements by relevant industries e. g. motor vehicle industry, are met. Ragn-Sells has sufficient capacity in its facility to meet EcoRubs needs of rubber powder / granules for the foreseeable future. EcoRub and Ragn-Sells both have high expectations the cooperation. For example, regarding the acceptability of the recycled rubber materials and their dissemination to various uses. C.E.S.I. Conclusion: Now, EcoRub is ready to finalize major contracts with major customers (discussions are ongoing according to the CEO). The author, Cutting Edge Science Invest, is an EcoRub share holder. Cutting Edge Science Invest can not guarantee, or take into accountability, the content of truth and accuracy of the information in this article/post.Thus, Cutting Edge Science Invest requires that a possible reader gather complimentary information if any type of investment in the company described above is considered. Cutting Edge Science Invest provides personally biased information and at best also “general information and opinions”. The article/post does not contain professional investment advice.